Independent School Alliance Incorporation Day is on March 19, 2019! At ISA, we open the door to unparalleled education for students of color, opportunities many didn't know existed. For racial communities currently underrepresented in independent schools, we provide a pathway to success through application assistance and ongoing support programs. Our ISA students and their parents are family. We are by your side from your first contact with us until long after your student graduates. Our goal is to find the school that is right for your student. We aim to demystify the complex admissions process and guide your family through application submission, the interview, entrance testing, and tuition assistance application. Once your student is accepted, we will continue to provide robust support programs throughout their educational journey. We'll open the door, your student will make their mark. "﻿The Independent School Alliance means a lot to me. It means support, opportunity, and a great education." ﻿"The Independent School Alliance signifies a family. It gives a deeper sense of community." "The Alliance and St. James School have been a blessing for all my family. The Alliance was the guiding light that took us to what we consider one of the best schools in Los Angeles..."
"The Independent School Alliance propelled me in the right direction toward reconciling who I am with where I am. It also helped clarify my calling to pave a road to success for growing black and brown girls." Click here to visit our Alumni Page. "The Independent School Alliance gave me the gift of access to an exceptional education. They provided resources and a sense of community that supported my family through my sometimes exclusive-feeling independent school." Click here to visit our Board & Advisory Council Page. Congratulations to our newest staff member! 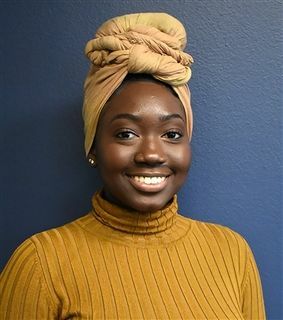 It is with a warm welcome that we introduce our newest team member Fatim Tall, Administrative and Operations Assistant. To read more about her experiences and interests visit our Meet The Staff page by clicking here. At our 14th Annual Luncheon, Miaya spoke on the importance the Independent School Alliance has had in her life and about her growth through her independent school experience! To know more about her and to read her speech, click "read more".